We have a wide range of shorts and skirts available off-the-shelf and custom-made. We can provide a large range of colours, fabrics and styles from classic cuts to the current lower waisted fit. Our custom designed skirts are specially made to your individual requirements in regard to colour, fabric and fit. 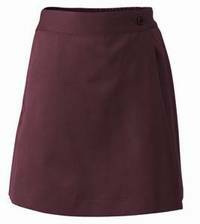 Tailored walk shorts and skorts in classic colours are an excellent alternative to skirts for more active students whilst maintaining a neat and stylish look. We have a wide selection available off the shelf which are both fashionable and practical.